The Twin Cities theater scene is broad and deep, with over 70 professional theater companies offering a diverse array of storytelling. Most of the theater spaces are in the Cities themselves, specifically Minneapolis. But the seven-county Metro area is populous and geographically large. Why should those of us who live in the suburbs have to travel into the city to see professional theater? Fortunately there is a growing remedy to that. 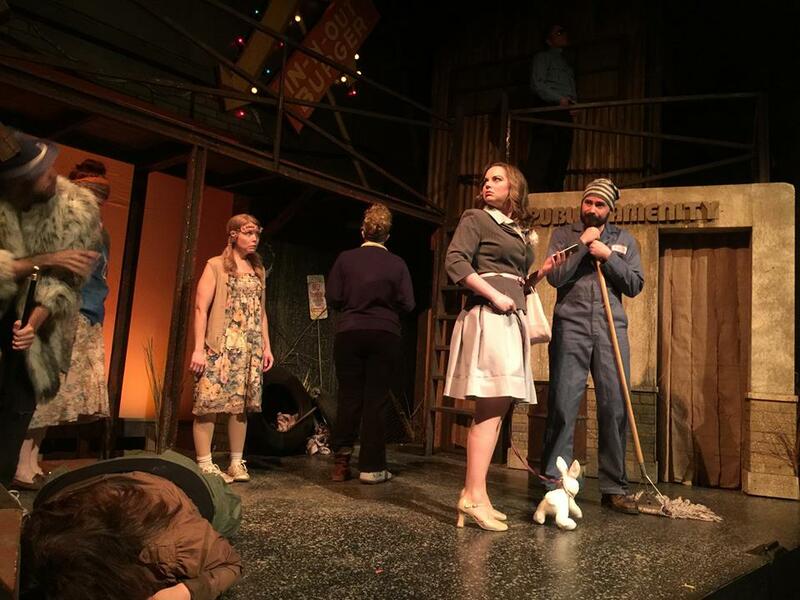 We have Yellow Tree Theatre in Osseo, on the Northwest side of the cities, about to enter their 9th season. And even further out, we now have DalekoArts in New Prague, founded by local theater artists Ben Thietje and Amanda White "as a way to help decentralize professional theatre in Minnesota." Approximately 46 miles from Minnesota's theater mecca Minneapolis, New Prague is on the very Southern border of the seven-county Metro area. When I was growing up very near there (just outside of the tiny town of New Market) in the '70s and '80s, it was a rural area, but has since experienced tremendous growth. While it's a bit sad to see the bucolic land of my childhood overcome with housing developments and fast food restaurants, the good news is that's a lot of people to support the arts. 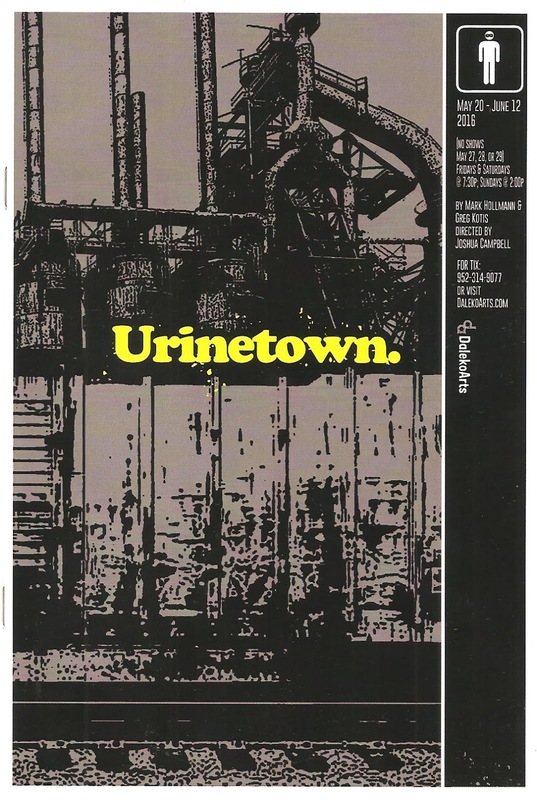 Judging by my first visit to see their hilarious and crisp production of Urinetown, Daleko (which means "far away" in Czech) seems to be filling that role quite nicely. Southern Metro-ans - take note! 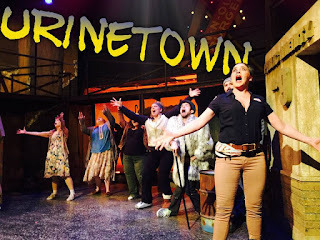 In addition to being biting social commentary about the world we live in and the future we just might be facing if we don't change our ways, Urinetown is also a musical that's an homage to the musicals that have come before it, and the form itself. The book and score are filled with references to Fiddler on the Roof, West Side Story, and Les Miserables, among others. Director Joshua Campbell and choreographer Erin Sheppard have brought out every one and perhaps even added a few, as well as setting a tone that's campy and broadly comedic. A tone that every one of the 11 actors (about as many as can realistically fit on a stage that's only 12 feet deep) commits to fully. If high camp, exaggerated gestures, and sight gags are not your thing, you might want to stay away. But if they are, you're sure to get a great two-hour laugh workout from this show. Several ensemble members will be familiar to you if you're a regular theater-goer in the Twin Cities (New Prague is close enough to draw great talent from the Cities), and some may be new to you. Co-Artistic Director Ben Thietje is wonderfully sincere in the role of Bobby Strong, the hero of the story. Kendall Anne Thompson is the perfect Hope, and while she typically makes me cry every time she opens her mouth (see this or this), that was not the case here, proving that she can do funny as well as emotional. Kate Beahen is so hilarious and strong of voice as the amorous Pennywise that it's easy to overlook the fact that she's way too young for the role. Paul Reyburn's Mr. Cladwell is like a warped Daddy Warbucks, and Tom Karki has the deep resonant voice and storytelling charm needed for narrator Officer Lockstock. In my mind, Kim Kivens is the queen of musical comedy in this community, and she brings every bit of that talent to the role of Little Sally. Hard-working ensemble members Beth Leona King, Zakary Morton, Keith Hovis, Mary Palazzolo-Rudquist, and Christine Karki play multiple roles with some crazy fast quick-changes. Eleven actors is a pretty small number for this show, but they make it work and even poke a little fun at the situation. DalekoArts has moved around a bit and has now settled in the Prague Theatre, an old movie theater, on Main Street in the old downtown part of New Prague. It's a tiny space which makes for some up-close-and-personal and intimate theater, and best of all, no need to mic the performers, even in a muuusical. The sound mix is great with the off-stage band directed by Anthony J. Sofie, that sounds bigger and fuller than its four members. The small stage space is increased with the addition of a balcony, and the whole thing looks every bit as decrepit as a show about toilets should (scenic design by Robin McIntyre). Samantha Kuhn Staneart's costumes are sharp or shabby, depending on the character (and I want Hope's dress!). 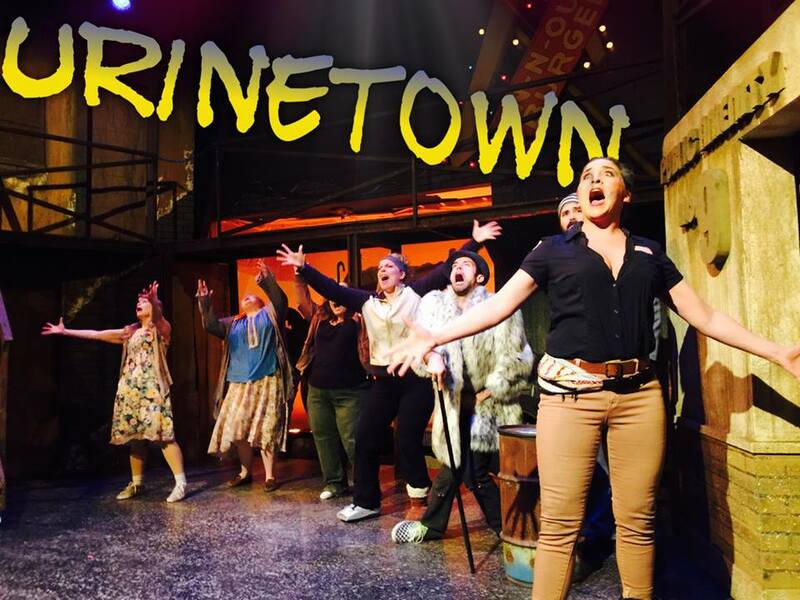 Urinetown is a great musical, one of my favorites, with sharp social commentary, musical theater references, and just plain fun. DalekoArts is doing some wonderful things with it. I really enjoyed my trip to New Prague and look forward to more in the years to come, and to watching them grow and expand the theater community outside of Minneapolis and St. Paul. And while I'm not suggesting that people who live in Minneapolis should travel to New Prague to see theater (although it's certainly worth the effort if there's a show or cast that looks intriguing to you), it's definitely worth a visit if you live in the Southern suburbs. In fact, with the state of construction and traffic these days, New Prague might be easier to get to than Minneapolis. DalekoArts is a wonderful option for seeing great theater in a charming old historic downtown, with a beautiful drive through softly rolling hills and green fields. The moral of the story is - seek out theater in your own town or neighborhood, because theater is everywhere (and if anyone wants to start a theater company in the Northeast suburbs, I'll be your biggest fan and supporter!). 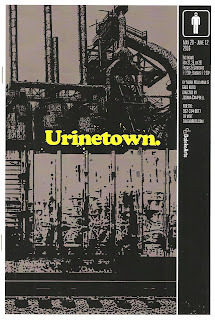 Urinetown is taking a break for Memorial Day weekend but will be back for two weekends in June. More information about this and upcoming shows can be found on their website. *Plot summary borrowed from my post about Jungle Theater's 2013 production.